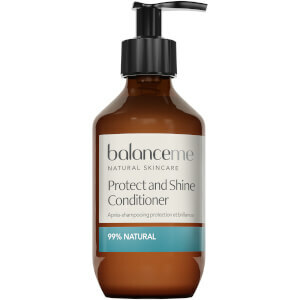 Replenish and revitalise hair with Balance Me's Protect and Shine Conditioner; a deeply nourishing formula that delivers intense moisture and hydration to leave you with strong, healthy-looking locks. 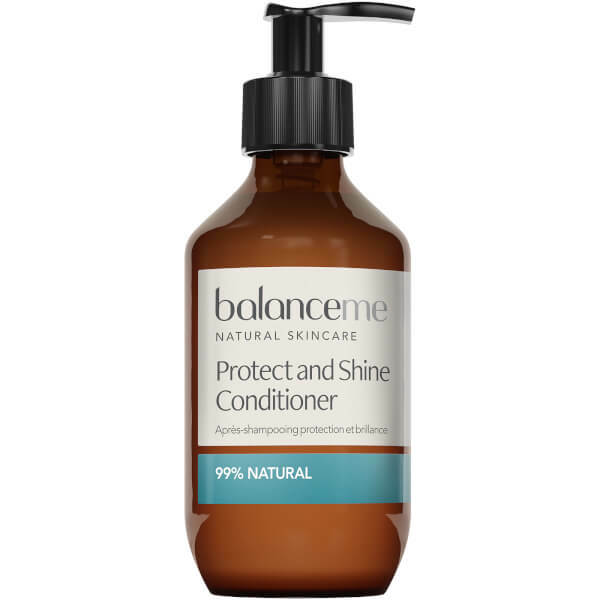 Harnessing the powers of Sweet Almond and Argan Oils, the weightless conditioner combats dull, weak strands and helps to prevent split ends, whilst soothing and protecting the scalp to restore long-lasting comfort. Hair is soft, glossy and rejuvenated from root to tip. Apply to wet hair and use fingers to spread from root to tip. Leave on for 1–2 minutes. Rinse thoroughly. Aqua (Water), Cetearyl Alcohol, Behentrimonium Chloride, Ceteareth-20, Limonene², Citrus Grandis (Grapefruit) Peel Oil¹, Argania Spinosa (Argan) Kernel Oil, Aloe Barbadensis (Aloe Vera) Leaf Extract³, Citrus Nobilis (Mandarin Red) Peel Oil¹, Lavandula Angustifolia (Lavender) Flower Oil¹, Prunus Amygdalus Dulcis (Sweet Almond) Oil, Juniperus Communis (Juniper) Fruit Oil¹, Anthemis Nobilis (Roman Chamomile) Flower Oil¹, Piper Nigrum (Black Pepper) Fruit Oil¹, Glycerin (Vegetable), Polyquaternium-7, Hydrolyzed Wheat Gluten, Citric Acid, Isopropyl Alcohol (Isopropanol), Guar Hydroxypropyltrimonium Chloride, Potassium Sorbate, Dehydroacetic Acid, Benzyl Alcohol, Linalool², Geraniol². (¹) natural pure essential oil, (²) naturally occurring in essential oils, (³) certified organic ingredient.